Reystylin Smooth, ridden by Justin Chalmers. Hart Photography. August 1, Fort Worth, Tex. 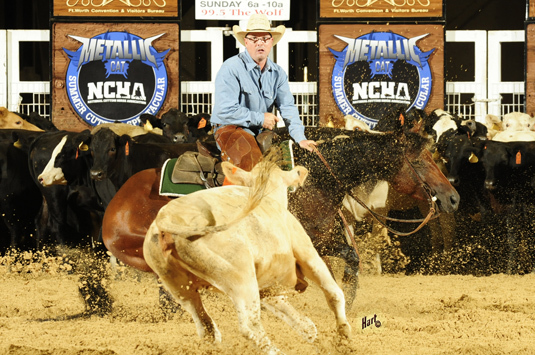 Justin Chalmers showed Reystylin Smooth, bred and owned by Eddie and Barbara Young, San Angelo, Tex., to win the 2018 NCHA/Metallic Cat Summer Spectacular Derby Open Limited Finals with 220.5 points. Kevin Walden and Couture De Force, bred and owned by Lori and Bobby Gale, Conway, S.C., claimed reserve with 219 points, while Andy Sherrerd and Shesmypridenjoy, bred by Alvin Fults and owned by Mark Stucks, Burleson, Tex., placed third with 217 points. Reystylin Smooth LTE $21,768, by Smooth As A Cat, is out of Rey N Style LTE $102,608, by Dual Smart Rey. The Youngs sold the then 5-year-old Rey N Style to Rex and Rhenda Tillerson�s Bar RR Ranches, for $89,000 in the 2013 NCHA Futurity Sale. Reystylin Smooth is Rey N Style�s first performer. Justin Chalmers showed Reystylin Smooth to win the Cattlemen’s Derby Open Limited and place seventh in the Cattlemen’s Derby Open. The pair also placed third in the Abilene Spectacular Open Limited and ninth in the Derby Open. 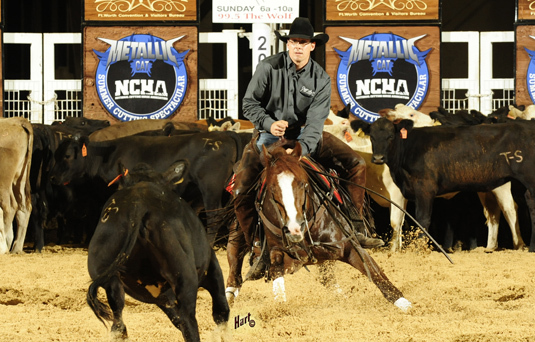 Chalmers, 2006 NCHA Senior Youth Rookie of the Year and NCHA earner of $92,539, won the 2017 NCHA Derby Open Limited and the Abilene Spectacular Open Limited riding HC Herd Boss LTE $28,824, also bred and owned by Eddie and Barbara Young. Couture De Force, ridden by Kevin Walden. Hart Photography. Couture De Force LTE $8,615, by Stylish Wood, is out of Short A Shay LTE $175,691, by Shorty Lena. Walden showed her as a an NCHA Super Stakes Open Limited finalist, while Bobby Gale rode her as a finalist in the NCHA Derby Amateur Unlimited. Her dam, Short A Shay, who placed third in the 2006 NCHA Open World Championship standings, is the producer of six NCHA money earners, including 4-year-old Hershay Kiss LTE $23,497, by Metallic Cat, and Sashay Cat LTE $37,798, by High Brow Cat. Kevin Walden is the NCHA earner of $424,907. Shesmypridenjoy LTE $1,505, by Metallic Cat, is a full sister to five horses who have each earned over $100,000, including Metallic Rebel LTE $411,837, 2017 NCHA Open Horse of the Year. Their dam, Sweet Abra LTE $117,725, by Abrakedabracre, has produced 12 NCHA money earners of $1,079,294. 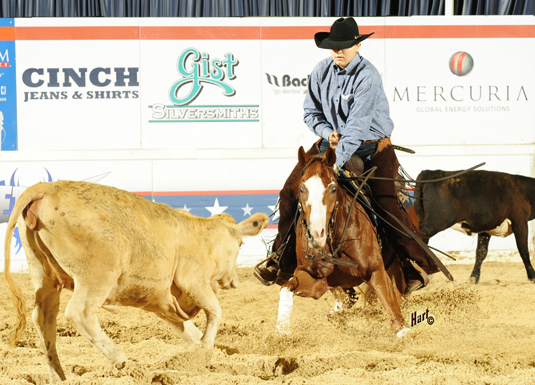 Andy Sherrerd, the NCHA earner of $968,760, showed Smart Catarey, also owned by Mark Stucks, as a 2018 NCHA Super Stakes Open Limited finalist, after Stucks and the Dual Rey daughter competed in the 2017 NCHA Futurity Amateur Finals. Regan Plendl on Cats Lightning Rey. Hart Photography. Ashley Flynn, who scored 221 points on Tuesday riding Smooth Lines, by Smooth As A Cat, remained the top-scoring of Non-Pro rider at the conclusion of first go-round competition, on Wednesday. Regan Plendl, who scored 219.5 points on Wednesday riding Cats Lightning Rey, by NRR Cat King Cole, claimed the top score in the Limited Non-Pro division. Bridey Greeson, with 219 points on CR Smart Boots, by Boon Too Suen, marked the second-highest score in both Non-Pro divisions, while Megan Miller with 218.5 points on Spur That Spot, by Spots Hot, claimed the third-highest and Kevin Murray with 218 points on Rockin Metallic was third-highest in the Non-Pro Limited division. The 2018 NCHA/Metallic Cat Summer Cutting Spectacular continues daily through Aug. 5th. For live webcast and live scoring go to NCHAcutting.com.